Infor CRM optimizes customer data – a vital company asset in today’s data-driven business environment. The high-tech CRM offers wide customization and powerful capabilities that lets you provide personalized experiences to your customers as well as drive employee productivity and improve your CRM processes. The software allows you to address business requirements when it comes to creating information-filled profiles of customer, delivering integration and connectivity, and giving full support to your mobile teams. Infor CRM provides deep analytics and evaluation of KPIs so you get a better view of performance from your team and business operations. You’ll be able to expand your reach and make information-based decisions that help improve company revenues. The software is offered via custom pricing, allowing you to get the best mix of tools and features tailor fit for your business. Infor CRM does much more than to improve relationships between businesses and their consumer base. This feature-packed CRM tool has all the essential applications and functionalities to you succeed in today’s very competitive landscape by enabling you to pinpoint solid prospects, retain current customers, and get full visibility over your business. With Infor CRM, you can build rich client profiles based on precise interactions and information sourced from relevant data inside and outside of your organization. With its integration options and collaborative tools, you’ll have a more cohesive and productive team to carry out their tasks. Infor CRM works with a number of ERP platforms to give your business a scalable and robust framework. Alongside cloud, mobile, and social capabilities, the unified solution provides unprecedented visibility over your entire enterprise. With Infor CRM, it is easy to empower your mobile workforce. The platform extends its rich CRM functionality to smartphones and tablets, ensuring that your field personnel and mobile employees have that strong and distinctive competitive advantage that can help drive productivity and significantly raise your business revenue. Infor CRM also comes with a plethora of reporting and analytics applications that allows users to address user and company requirements at all levels of sophistication. From basic lookup, group, and reporting capabilities, to interactive dashboards, timeline visualizations, and custom reports, Infor CRM delivers powerful solutions that dramatically boost individual effectiveness and maximize organizational and customer intelligence. Every company has different requirements and requires a system that can be personalized for their size, kind of employees and customers, and the particular industry they are in. For these reasons, no platform can offer perfect functionality out-of-the-box. When you look for a software product, first be sure what you want it for. Read some Infor CRM reviews and ask yourself do you need basic functionality or do you need sophisticated features? Are there any industry-specific features that you are seeking? Find the answers to these questions to help your search. There are plenty of factors that you need to consider and these include your finances, particular business wants, your company size, integration requirements etc. Take your time, try out a few free trials, and finally zero in on the app that offers all that you require to boost your company competence and productivity. 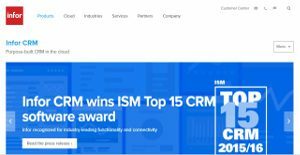 How Much Does Infor CRM Cost? Infor CRM pricing information is available only upon request. Contact the vendor directly to get a quote for your company. We realize that when you make a decision to buy CRM Software it’s important not only to see how experts evaluate it in their reviews, but also to find out if the real people and companies that buy it are actually satisfied with the product. That’s why we’ve created our behavior-based Customer Satisfaction Algorithm™ that gathers customer reviews, comments and Infor CRM reviews across a wide range of social media sites. The data is then presented in an easy to digest form showing how many people had positive and negative experience with Infor CRM. With that information at hand you should be equipped to make an informed buying decision that you won’t regret. What are Infor CRM pricing details? What integrations are available for Infor CRM? Infor CRM offers standard open APIs & integration options. Pros: "XBar", Infor CRM's Outlook integration solution, is one of the best Outlook integrations on the market. It's evident it put in tons of time and resources into the product. It also has one of the very best (and easiest to use) mobile clients for mobile sales teams. Cons: Infor CRM doesn't have as many integrations as Salesforce or SugarCRM and is harder to customize. Some users may also find that it isn't for their particular industry. It is a very horizontal product, but I see it working best for manufacturers and heavily-mobile sales teams. Pros: Infor CRM allows me to view individual notes or scroll down through a continuous sales history. Creating groups and associations lets me easily reference similar accounts meeting criteria that I define, or put my "crib notes" and important facts I want to easily reference. Cons: Search function is a little clunky. It will give you every instance of a word, but it's usually too much to be useful. I hate that the system crashes unless I use the Firefox browser; I much prefer Chrome or even IE. Also, I hate that if I have to change a window quickly, I lose everything unless I obsessively click the "save" icon all the time. I can't even rearrange the toolbar to suit my needs rather than some arbitrary configuration. If you need more information about Infor CRM or you simply have a question let us know what you need and we’ll forward your request directly to the vendor.